If your child has a list of cold symptoms – you need a multi-symptom solution. 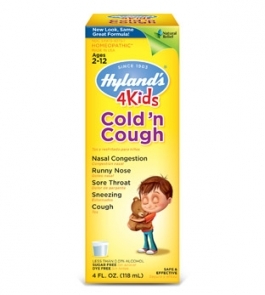 Hyland’s 4 Kids Cold ’n Cough is the go-to cold product that so many parents have come to depend on. Its formula is designed for kids 2 years old and up. It eases the sneezing, soothes the sore throat, and loosens up the congestion. * If it could talk, it would even read to your child to sleep. We’re working on that. Temporarily relieves the symptoms of the common cold including nasal congestion, runny nose, sore throat, sneezing, and cough. Cough tends to recur or is accompanied by high fever, rash or persistent headache. Do not use this product for persistent or chronic cough such as asthma, smoking or emphysema or if cough is accompanied by excessive mucus, unless directed by a licensed health care professional. A persistent cough may be a sign of a serious condition. There have been no reports of interactions between this product and ibuprofen or acetaminophen.